The computer science scheme of work has been carefully created by working back from the key content that students need to be able to achieve the highest grade at A Level and in turn the key content that students need to achieve the highest grade at GCSE. The content that students need to cover within each unit is framed using an over-arching ‘fertile question’, each of which will incorporate different skill strands. For example, while investigating the fertile question ‘Can being S.M.A.R.T. keep you safe online?’ students will learn the concepts of safety and security while using the Internet. The six main topics which are covered in the computer science curriculum are Communication Networks, Algorithms, Programming and Development, Hardware and Processing, Data and Data Representation and Finally Information Technology. Through these, students will develop computational thinking skills needed for GCSE and A-Level, such as, algorithmic thinking, evaluation, decomposition, abstraction, and generalisation, the building block so of computational thinking. As this is a new subject for year 8 students, their curriculum follows very similarly to that for year 7. 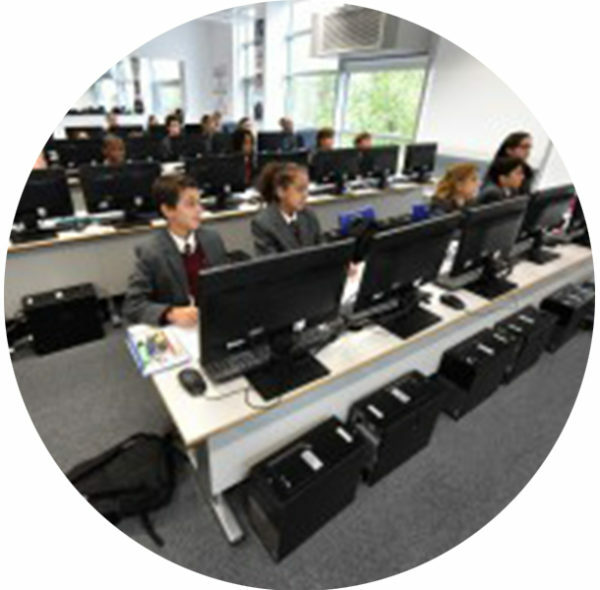 However, the year 8 students will be expected to reach a much higher level, achieving many more of the computer science targets set by the criteria along the way. Autumn 1 How can being SMART keep you safe online? Spring 1 Can a turtle draw a logo? Spring 2 How can a logo draw a turtle? Summer 1 How many numbers can fit inside a table? Summer 2 How can a database win at games? All assessment will be based on work around the fertile question of the term and be set in GCSE style examination formats, involving shorter answer questions, leading onto longer responses. The assessments will be done on computer, so computer proficiency is vital. Main assessments will be termly and the results of these will be reported. However, mini, half termly assessments will still occur, to check that students are on track. Students have one thirty minute homework each week. These are set on different (but fixed) days depending on which teaching group a child is in. All homework should be done on computer, and should not be printed out unless specifically stated. This is so a culture of appropriate computer use is developed among all students. All details of homework will be available on KAA Online for which every student will have a login – this allows all students access to the homework regardless of whether they miss a lesson or lose their planner. • Computer Science Workbook: (https://sites.google.com) All students have a computer science workbook found at the above web address, where all work and lesson notes can be found. All homework should also be done through the workbook, unless otherwise stated.